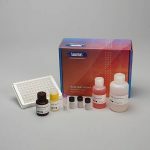 The Salimetrics Estrone Enzyme Immunoassay Kit is a competitive immunoassay specifically designed and validated for the quantitative measurement of salivary Estrone. It is not intended for diagnostic use. It is intended only for research use in humans and some animals. Salimetrics has not validated this kit for serum or plasma samples. 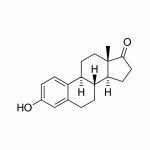 Estrone [3-hydroxy-1,3,5(10)-estratrien-17-one; E1] is a naturally occurring steroidal hormone. A major portion of Estrone is produced from androstenedione in prepubertal children, men, and postmenopausal women. Circulating Estrone levels are relatively high at birth in both males and females, decrease postnatally, and increase during puberty. Of the three major estrogens, Estrone is predominant after menopause in women. Estrone is primarily secreted by the ovaries in premenopausal women, peaking in the preovulatory phase with a smaller secondary increase during the luteal phase. Estrone is a primary component of many pharmaceutical preparations. Research concerning Estrone is often focused on pregnancy, reproduction, and menopause. However, estrogens affect a diverse group of biological processes such as arterial vasodilation, bone density, cognitive function, and neuroprotection. Estrogens are also studied in regard to coronary artery disease, immunocompetence, cancer susceptibility and polycystic ovarian syndrome. This is a competitive immunoassay kit. Estrone in standards and samples compete with Estrone conjugated to horseradish peroxidase for the antibody binding sites on a microtitre plate. After incubation, unbound components are washed away. Bound Estrone Enzyme Conjugate is measured by the reaction of the horseradish peroxidase enzyme to the substrate tetramethylbenzidine (TMB). This reaction produces a blue color. A yellow color is formed after stopping the reaction with an acidic solution. The optical density is read on a standard plate reader at 450 nm. The amount of Estrone Enzyme Conjugate detected is inversely proportional to the amount of Estrone present in the sample.